ue4.11 add a character rendering example in the content examples in the market. or you can check the game paragon, epic developer the new skin and eye shader for this game. This was based on that engine version but written before they released their eye pack. or you can put your sample in the market, i think many programmer will be interested in. because it's hard to get high quality model and texture. Thanks, it's something I will think about. I would love to study your work, post on the UE4 forums too if you haven't! Much more likely to see improvements from Epic or programmers in the community. Also, wouldn't it be nice if you could use UDIM? Several 2K or 4K Normal maps instead of a single 8k or 16k. I haven't used it, but this plugin apparently lets you use UDIM in UE4 as well as maps up to 256K in size. Hi, thanks. I had planned to post on the UE4 forums but didn't want to get blasted for posting such a heavy advertisement thread there. Or getting heavily critiqued as it's all WIP. 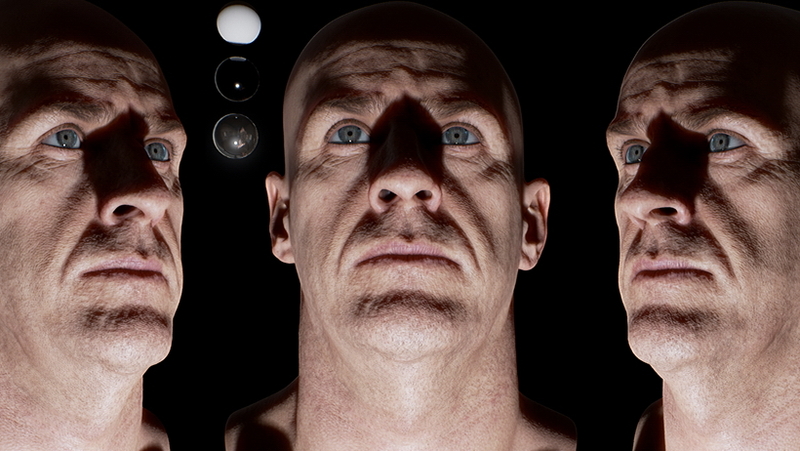 I hope to revisit UE4 and skin again soon once IR's new scanner system is up and running. I was in contact with Epic about possible skin improvements but nothing further came from it. UDIM could be interesting for sure. Thanks for the link! Thanks for your interest. Sadly we can't share the shader as you would require a full custom engine version of UE 4.11 which is about 50GB. It might be best to start a thread on the UE4 forums or contact Epic about your request. It would be great if Epic could integrate SSS deep scatter into their Engine directly. Brian Karis is the main lead developer on digital skin there I believe. Are you sure about the blue specular? I can see from your next-generation photometric scanning page that the difference between your polarized and non-polarized shots is indeed blue, but that doesn't really match with any literature I've read about skin rendering. The USC Digital Emily (http://gl.ict.usc.edu/Research/DigitalEmily/) project uses polarization too, but the shots are much more similar in hue and are missing the shift you have, so the extracted specular is largely monotone. Great work though, and I'd echo that I'd love to get hold of the assets, as having reference shots of easily matchable lighting is fantastic for verifying your shading. Thanks for the post. If you check there Emily 2 data, you will see it has the exact same blue specular hue. From talking with others I believe it comes from the lamps used, in combination with the filters. If you remove the blue hue from the specular separated image and apply back with linear dodge, the skin looks dead. The blue is present and required. I'm not sure why others have not addressed it but it does seem important. Hmm, I had a look at Emily 2 and I'm not seeing any blue in the exr, or the specular reference data. They get exactly the same results they just choose not to show it by desaturating the results http://imgur.com/D83JhGE The blue hue is present. It depends on the colour calibration used. If you were to desaturate those results and add back, the skin will look flat and dead without that extra colour component. Interesting. I'm still not totally convinced it's not an artifact from the capture, but it wouldn't be the first time that observing that something looks better with some tweaks exposes problems with existing lighting models. I'm very interested by your SSS shader, that awesome !!! Is there any feedback from Epic yet? I would love to see backscatter in the editor! Nothing. Best to talk with them. I hope they will include back scatter, it's integral. Oh man, I love that SSS backscattering! I really want to know how did you do that in UE4. Is there any chance to learn this? You would need a custom change made to the core engine. Not something we can help with sorry. Would you share how to implement the back lit transmit? I just guess that can calc the thickness "d" at ShadowProjectionPixelShader and save exp(-d*d) in one channel of shaodw buffer, and sample it at DeferredLightPixelShader. But under this you can only use 1 exp and can only do single transmit, from your result I notice multiple transmit was take in consideration. So maybe you can give some advice. For the skin and eye it looks much better and seems just need to change the material itself. Is it possible that share it? is a chance to share this changed source files and this shader setup on github? i am curious about your light match process... are you capturing a Hdri for each light conditions? i f so, how do you get the shadows??? i have being using the xuan prada (http://www.elephantvfx.com/) method, for the past month and its give me a good result, using the chrome /gray balls and the color chart. could you share some infos about your method?